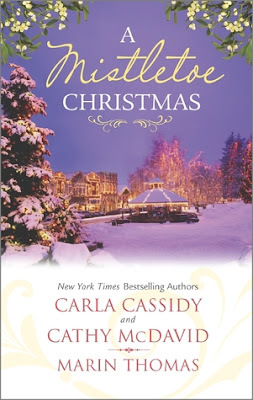 I just love holiday romances and A Mistletoe Christmas had me excited because of the lovely cover and the fact that this book has not one but three holiday romances. The blurb is interesting and I love stories by Carla Cassidy and Cathy McDavid. Marin Thomas was new to me but I just loved her writing style! All the three romances take place in the town of Mistletoe and all three stories we meet strong characters tackling problems, carrying past baggage and definitely not looking for love but fate works in mysterious ways to give them happily-ever-afters that had me sighing and feeling so happy! 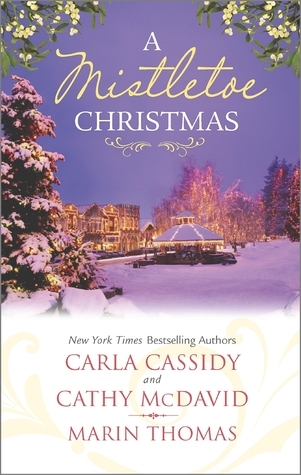 I enjoyed the varied writing styles of Carla, Cathy and Marin in their respective stories and this book came as a breath of fresh air, a definite feel good book right before the holiday season. All in all, A Mistletoe Christmas has three super lovely and entertaining stories that will lift your mood and surround you with love and the magic of Christmas. I absolutely loved it and give the book 4.5 stars out of 5. Recommended to everyone, I look forward to reading more from these very talented authors in the future.